What are recent recruits' views on the policy change allowing women in combat? What changes do recent recruits, recruiters, and recruiting leadership feel would aid recruiting in general and recruiting of women specifically? This study identifies approaches for bolstering recruiting of women into the armed services during the years in which ground combat jobs are transitioning to include women. RAND conducted in-depth interviews and focus groups with new recruits, recruiters, and recruiting leadership. Several themes emerged from these discussions. Many female recruits in our focus groups preferred female recruiters and female-specific events. Many male recruits in our focus groups reported not being influenced by the policy change to open combat jobs to women. Recruiters and recruits in our focus groups reported dissatisfaction with what they view as burdensome administrative requirements. Both recruiters and recruits recommended launching advertising campaigns showing women serving alongside men in a wide range of military jobs, and debunking stereotypes of military service. Finally, commanders of the recruiting services reported concern over resources available to them in the current environment. We recommend that resources be set aside to specifically target outreach to women, that the services increase the proportion of recruiters who are women and increase their visibility at recruiting events, and that the services work to reduce administrative burdens on recruiters and recruits. Many recent recruits in our focus groups did not view the opening of combat jobs to women negatively, and many female attendees had a positive view. Some female recruits spontaneously brought up the topics of sexual harassment and assault, usually in the context of parents' concerns about them joining the military. Recruiters also mentioned this as a concern that was commonly raised by parents during the recruiting process. Multiple recruits and recruiters suggested that more female recruiters and greater visibility for female recruiters would help with recruiting women. Recruiting commanders and multiple recruiters suggested that they needed more resources to run campaigns specifically targeting potential female recruits. Increase the proportion of female recruiters and create programs and strategically place them to maximize their impact (ensuring visibility, creating mentorship programs, regular meetings with female recruiters). Increase outreach targeted towards women (advertising, women-only group events). Reduce administrative burdens on recruiters and recruits (reduce timekeeping requirements, use technology to streamline forms). Allocate additional resources to support new initiatives targeting women. Conduct follow-on research evaluating the effectiveness of any new outreach programs and direct resources towards those programs that prove successful. This research was sponsored by the Office of the Under Secretary of Defense for Personnel and Readiness (OUSD/P&R) and conducted within the Forces and Resources Policy Center of the RAND National Defense Research Institute, a federally funded research and development center sponsored by the Office of the Secretary of Defense, the Joint Staff, the Unified Combatant Commands, the Navy, the Marine Corps, the defense agencies, and the defense Intelligence Community. 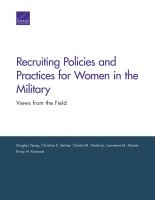 Yeung, Douglas, Christina E. Steiner, Chaitra M. Hardison, Lawrence M. Hanser, and Kristy N. Kamarck, Recruiting Policies and Practices for Women in the Military: Views from the Field. Santa Monica, CA: RAND Corporation, 2017. https://www.rand.org/pubs/research_reports/RR1538.html. Also available in print form.